Yesterday, during my tour of Lollipop on the Galaxy S5, I mentioned that Samsung may have left out Smart Lock, which is one of our favorite features included in Android 5.0. For those not familiar, Smart Lock is like Motorola’s Trusted Devices feature, in that it allows you to bypass secure lock screens if you have a trusted Bluetooth device attached and nearby. It’s incredibly handy and one of the more useful features introduced by Google in Lollipop. To see it missing was disappointing, to say the least, except, well, it was actually there all along. That’s right, Smart Lock is included with Lollipop on Samsung devices, it’s just hidden by default and semi-difficult to find unless you know where you need to look. Since we now know where to find it, thanks to a handful of readers who pointed it out, we wanted to share the good news. To find Smart Lock, you first need to set up a secure lock screen option (Pattern, PIN, password, etc.) by heading into Settings>Lock screen. Once you have done that, you need to back out to Settings, and then head into Security. 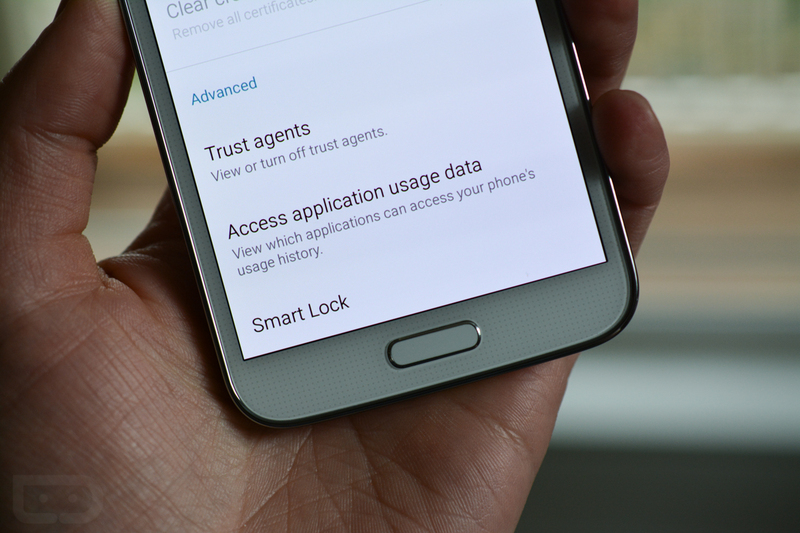 Within the Security screen, tap on Trust Agents, then turn on Smart Lock. From here, you can backup once and you should now see Smart Lock as an option at the bottom of the screen in the Security section. You are now ready to start adding trusted devices and places. To see Smart Lock in action, check out this post we ran back in October. To see the setup process for Smart Lock on Samsung devices, hit up the video below.